Running late for work but can’t decide on stopping for a coffee or grabbing a juice or smoothie? Well, now you don’t have to. We are excited to offer a full range of coffee bevvies at our juice lab locations. 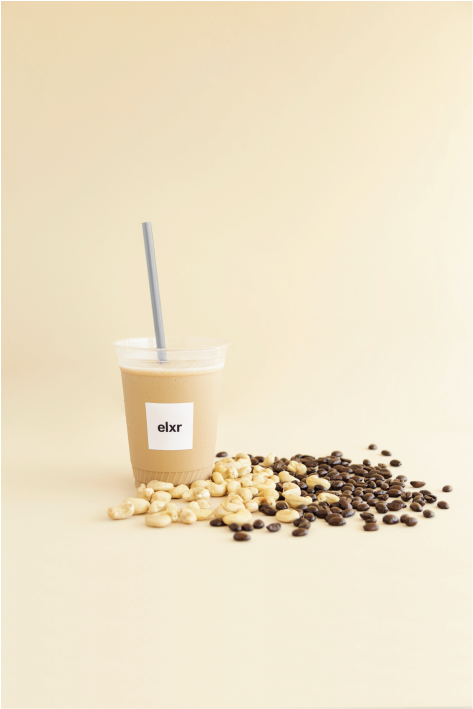 Whether it’s our better-than-your-average freshly ground drip coffee served hot or over ice, whipped up frapp-style with adaptogens, blended with raw almond butter and MCT oil, or packaged in our bottled Coco Brew, we’ve done our research and are proud to offer new caffeine-fueled selections that taste as good as they make you feel. You’ve met Coco Brew and Bullet Brew before, and now its time to learn about our newbies! 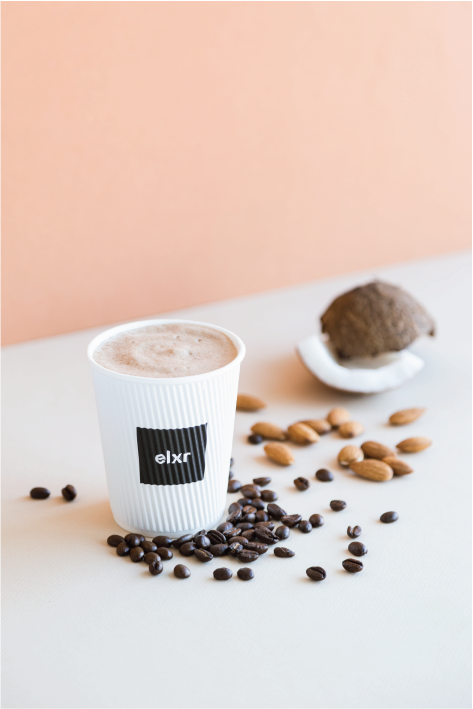 Scroll on for our new fave ways to get our days started (or banishing that 3PM slump), along-side our superfood smoothies, juices, healthy treats, overnight oats, and probiotic parfaits. 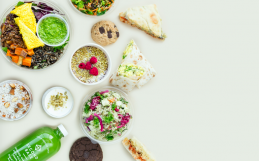 Stop by for an energizing taste of what’s new. Iced Coffee, Cashew Cream, Dates, Maca, Reishi, Ice. Honestly, it’s delicious. Tastes like a healthy caramel frapp! Coffee gives energy, and maca + reishi both support energy in another way that’s not depleting. Maca is an adaptogen that is great for helping the body to better adapt to the effects of emotional and physical stress. Maca is also energizing and is helpful for people of all ages. Reishi is a type of mushroom that is used extensively in traditional Chinese medicine to protect against the effects of stress. It provides energy and like all medicinal mushrooms, improves immunity. 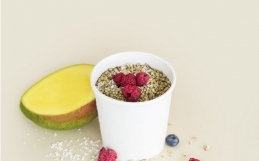 EachAdapto-Frapp contains 8 grams of protein! So it’s like a coffee smoothie: satisfying and creamy, with energy sustaining protein; helps to rebuild after workouts. Great pre-workout beverage: caffeine improves cardiovascular fitness, while the protein in the cashews will help you keep you going! Our coffee is provided by De Mello Palheta. 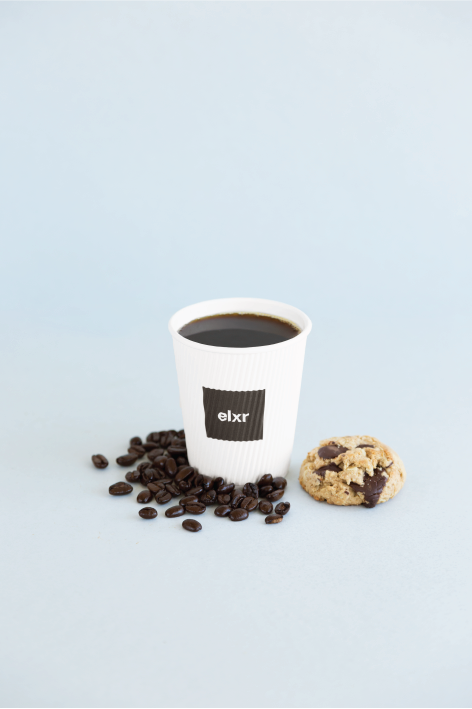 We sipped and sourced coffee for months to find the right fit and were inspired by this Toronto-born-and-raised coffee company, whose passion for coffee comes through with every interaction. Available hot or over ice! Darkly roasted beans provide a smooth low acid finish, with notes of caramel and chocolate (hello heavenly cookie pairing!). Locally roasted beans are ground fresh each time before we brew, giving you the fullest expression of the best coffee around. The coffee is organic + directly and fairly traded from small farms and estates in the Serras de Minas region in Minas Gerais, Brazil. Creamy coconut and cashew with a hint of maple perfectly pairs with the distinct Jimmy’s blend we love straight out of the bottle. 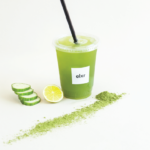 In this exciting made-in-Toronto project between two long-time partners, Jimmy’s Coffee’s signature blend gets an elxr superfood injection in this energizing and thirst-quenching brew. 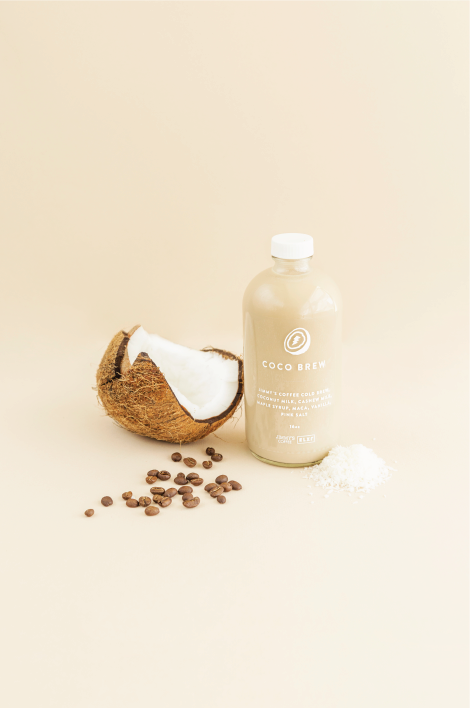 Coco Brew is both easy to drink and fortified with the adaptogenic superfood maca, great for stress reduction and energy. With a hint of maple syrup, this barely sweetened sipper is bound to become your new favourite way to get buzzed! Iced Coffee, MCT Oil, Coconut Butter, Raw Almond Butter. 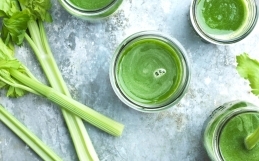 Creamy and energizing, this is perfect as is: nothing else needed. Why have bulletproof-style drinks have become extremely popular recently? Combining coffee or tea with MCT oil and other healthy fats give you energy that lasts. The caffeine hits your blood-stream more slowly due to combining it with the fats, so it affects you over a longer time AKA less jitters + more sustained energy. 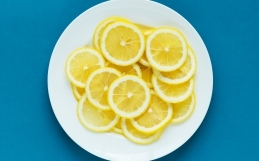 For those doing the ketogenic diet, having this first thing in the morning allows you to remain in a fasted state while still getting energy from the caffeine, and also from the MCT oil. MCT is derived from coconuts + stands for full, medium chain triglycerides. They are types of fats that are absorbed into the bloodstream and burned as fuel immediately, and not stored as fat.